Later, in the Philippines, he is thrust into the Spanish-American War and the anti-American insurgency that follows. But Billy’s troubles are just beginning. As the 19th century ends and the 20th century begins, he finds himself in Mexico and Europe entangled with political opportunists, spies, revolutionaries and an assortment of malicious characters of both sexes. How will Billy handle these people and the challenges they present? One thing is for sure: Billy is not in Kansas anymore. Book 2 begins in 1894—the year that Book 1 ended. 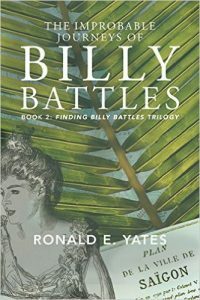 My objective in Book 1 was to chronicle the first 30 years or so of Billy’s life and show the events and tragedies that shaped his young life. So when book 2 begins, Billy has endured more tragedy and heartbreak than most people encounter in a lifetime. The 1890s were a time of great invention in America. The country was just beginning to enter the world political and economic stage. With the Spanish-American War in 1898 the so-called “American Empire” was created. The U.S. fought its first war outside of the Western hemisphere (The Philippines) and acquired its first colonies—The Philippines and Puerto Rico. These were heady times for the United States which was just beginning to flex its political and military muscle around the world. As Billy learns, however, when one nation exerts power over another, hostility and conflict are often the byproducts. We both stood at the ship’s railing in awkward silence for a few moments. I was waiting for Katharina to explain why she wanted to talk to me, but she seemed content to stare out at the glabrous black sea. I resolved not to disrupt whatever reverie had seized her and remained mute. The only sounds were the dull vibrating hum of the ship’s engines and the soft splash of water against the hull as the ship sliced through the ocean. It was about nine thirty, and a full moon irradiated the water with bright threadlike streaks of pale light. I found myself stealing quick but meticulous glances at Katharina’s profile silhouetted against the dim running lights of the ship. She stood about five feet ten inches tall, maybe four inches shorter than I was. Her beauty was breathtaking. She seemed perfect in almost every physical feature. Still, it was her personality, her caustic behavior that detracted from that stunning physical beauty. Until I met Katharina Schreiber, I was sure my late Mallie was the most beautiful woman I had ever seen. Of course, Mallie was also beautiful inside where it counted. I wasn’t so sure about the widow Schreiber. I was still debating that issue when Katharina, at last, broke the silence. I wondered if she was joking or being facetious about her problem being life or death. After all, I had experienced the widow Schreiber’s razor-sharp cleverness at the dinner table. When I turned to look at her, however, I was met with a face that was distraught. Her lips and chin were trembling, her bright green eyes were damp and glistened brightly in the pale light, and her knuckles were clutching the railing so tightly that they were turning white. I didn’t know what to say. I cleared my throat, but my words came out gravelly and dissonant. With that, she placed her hand softly on my arm. It was the first time she had touched me, and I felt an electric tremor as adrenaline surged through my body. My posture went suddenly rigid with legs and arms firmly tensed. I shuddered noticeably. “Are you all right?” she asked, quickly removing her hand from my arm. I covered my mouth with my hand and coughed quietly. “I think I may be coming down with something,” I lied. We stood there for another five minutes or so, and she related one of the most extraordinary stories I had ever heard. It seems the widow Schreiber had been a bit judicious with the facts at the captain’s table that first night aboard ship. Her German husband had indeed passed on, she was a widow, she had indeed grown up in Chicago of German parentage, and she was on her way to the Philippines to join her brother. That much was true. However, the rest of her story was almost unbelievable. “I am a widow because I killed my husband,” Katharina suddenly declared. Her eyes were focused keenly on me as if looking to see what my reaction to that astounding bit of news might be. I am sure I flinched a bit as her words sunk in. Katharina quickly interrupted before I could say more. “That seems like a rather subtle distinction,” I responded. Katharina was facing me squarely now, her face barely a foot from mine. This time when she spoke, it was in a voice just above a whisper.